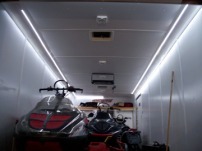 Our new brite Lites interior LED strips are now super long and molded in a white backing specifically for use in trailers and to light up the inside. 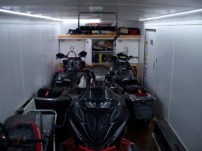 Super bright SMD square LEDs make these strips light up the entire trailer. Low power draw makes it a great solution for good light in side the trailer. Available in a 12 foot or 24 foot length. White LEDs in 12 & 24 foot lengths!